The view from the Sunrise Ridge Trail at Bear Mountain Lodge in Silver City, N.M. 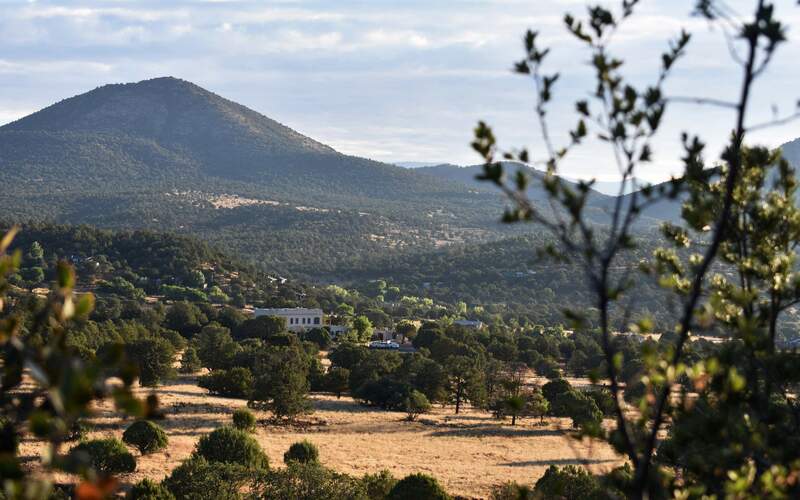 The trail is one of three on the 180-acre property adjacent to the Gila National Forest. We’ve always been a little unconventional. So when my husband, Michael, and I wanted to mark our 25th anniversary, rather than buying a silver platter, we looked for a place with “silver” in its name. Silver Spring, Maryland, was too close to home. Silver City, Utah? A ghost town. Then we discovered artsy, close-to-nature Silver City, New Mexico. Silver created this town of 10,000, its mines yielding 125 tons before closing early in the last century. We were enticed by the town’s history, its art scene, nearby cave dwellings, outdoor adventures, stargazing and 339 bird species in the national forest. Plus, chile-infused vodka. We flew to Tucson and rented a car for the three-hour drive into southwestern New Mexico. As we left the city behind, the landscape grew less cluttered – just the full-on open blue sky and ribbons of road beckoning to distant mountains. Our minds, too, began to untangle, and our spirits expanded. Surrounded by artIn Silver City, at 6,000 feet above sea level, we found a town that loves its history as much as it loves color and art, and combines all three in vivid murals. More than 20 galleries line the streets, and graceful hollyhocks brighten corner gardens. Outdoor art installations seem more common than traffic lights. The historical district, which includes eight blocks along Bullard Street, calls for a slow walk. 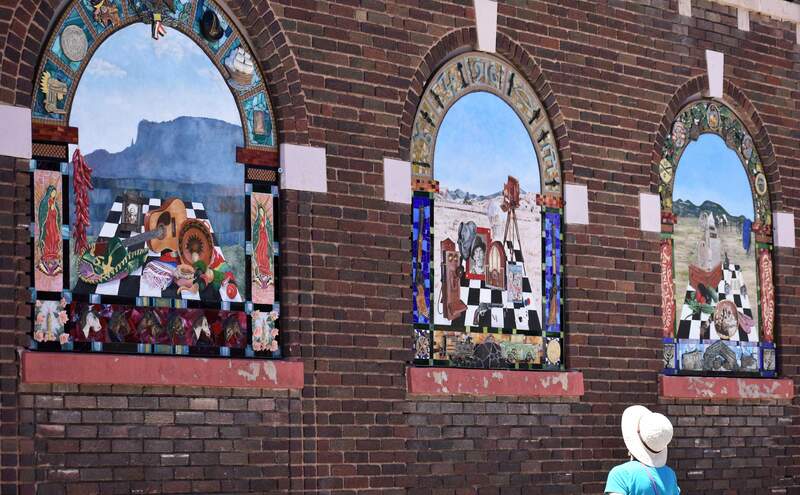 At one corner, mosaic murals cover the windows of the old Masonic Temple, telling local stories, about the Apache leader Geronimo; Billy the Kid, who grew up here; the Mimbres people, who left behind their distinctive pottery; and the Chinese who made a home here as miners and later as shop owners. These, and about 70 others in town, are the work of the Mimbres Region Arts Council Youth Mural Program. A mosaic completed by the Youth Mural Project of the Mimbres Region Arts Council tells stories about the people of Silver City, N.M. Originally a program that paired at-risk kids with artists, the mural project also helped connect those kids to their community, said Diana Ingalls Leyba, a local artist and gallery owner who helped start the program in 2003. Now, students and adults throughout the city participate. Syzygy Tile, a local company, provides the clay (almost 2 tons already this year, said Syzygy owner Josh White) and the glazes. The result is a city bursting with vibrant color and living history. A big part of that history involves a large ditch that used to be the town’s main street. In July 1895, thunderstorms generated a 12-foot wall of water, which roared from the mountains into the town’s main thoroughfare, smashing hotels and stores, saloons and offices. Surviving businesses began operating out of their back doors, making Bullard the main street. The Big Ditch is now a park 55 feet below the rest of the town, where the San Vicente Creek flows by cottonwood trees and walkways. As we strolled, we spied one of the town’s newest mosaics, the story of the flood. Along with the public art, Silver City is full of galleries, including Wild West Weaving, focusing on textiles; Leyba & Ingalls Arts, representing more than a dozen artists; and the Blue Dome Gallery, featuring pottery, folk art and paintings. Those galleries and almost two dozen more are spotlighted during Red Dot Weekend at the Galleries every October. Installation at the lodgeFor our anniversary getaway, we booked a room at Bear Mountain Lodge, a 1928 Pueblo-style guesthouse at the edge of the Gila National Forest that was built as a school for delinquents and is now owned by a group of artists. A quick drive from downtown, nestled in high desert dotted with piñon, juniper and sage, the lodge offers 11 rooms and breakfast. During our four-day stay, we fed carrots to the resident horses, tracked the moon above our balcony and woke to the yipping of coyotes. On our first morning, up before dawn, we hiked for 2 miles on Sunrise Ridge, one of three trails on the lodge property. Afterward, we enjoyed a bountiful breakfast: yogurt, homemade granola, bacon and French toast. We lingered over coffee, watching hummingbirds flit among several feeders on the sunny portico. Linda Brewer and her partner, John Rohovec, are Bear Mountain’s majority owners. A potter who also owns a gallery in town, Brewer has filled the lodge with art: in the rooms and lobby, on the porticos and throughout the grounds – even the trails. 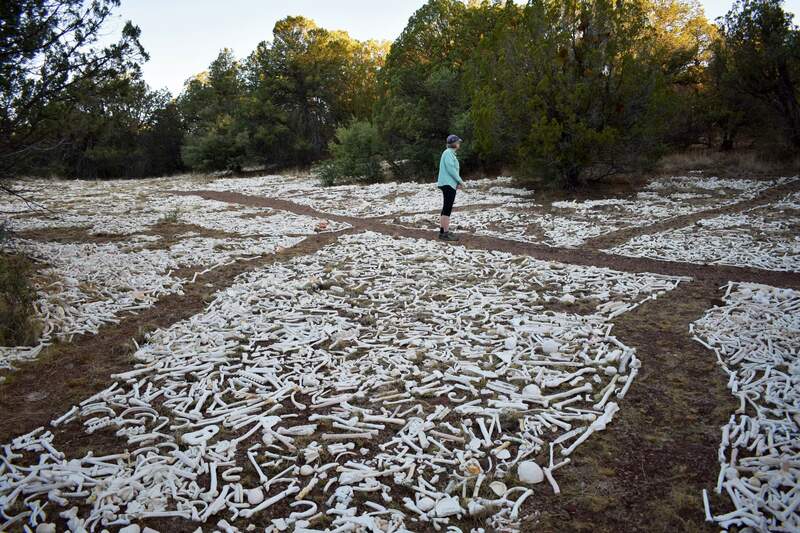 The “One Million Bones” exhibit fills a high meadow behind Bear Mountain Lodge. The powerful statement about genocide that was displayed on the Mall in Washington, D.C., in 2013 and now has a permanent home in a meadow on the lodge property. The newest outdoor art here is “One Million Bones,” a powerful statement about genocide that was displayed on the Mall in Washington, D.C., in 2013 and now has a permanent home in a meadow on the lodge property. It’s a work in progress: boxes upon boxes of bones – fashioned from clay by people all over the world – are still awaiting transport to the meadow. We joined the effort one morning, filling our backpacks with bones and trekking up a steep mile. We were not prepared for the vast, silent expanse of white. Skulls. Ribs. Femurs. Vertebrae. Some carefully arranged, others gathered in large piles. The bones seemed real, the meadow endless. Trail of Mountain SpiritsOn our second day, we drove 45 miles north on a winding state highway, part of the 93-mile Trail of the Mountain Spirits. The trail hits 10 sites, including a Geronimo memorial – the legendary leader was born nearby, an open pit mine and the Gila Cliff Dwellings National Monument. We climbed a switchback trail to the caves, where, in the 13th century, the Mogollon people turned them into rooms, using rock, mortar and wood. They stayed for only about 25 years – as long as our marriage has lasted, just a blink in historical time. The inhabitants left behind pictographs, sooty ceilings, piles of 700-year-old desiccated corn cobs and original wooden beams. Core samples revealed the wood came from trees felled around 1280. As we started back down the trail, I recalled our recent trip to Poland, where we visited medieval castles – also built from rock, mortar and wood, also from the 13th century, also still (mostly) standing, reminding us of the commonality of disparate cultures. Late that afternoon, we stopped in the old gold-mining town of Pinos Altos. 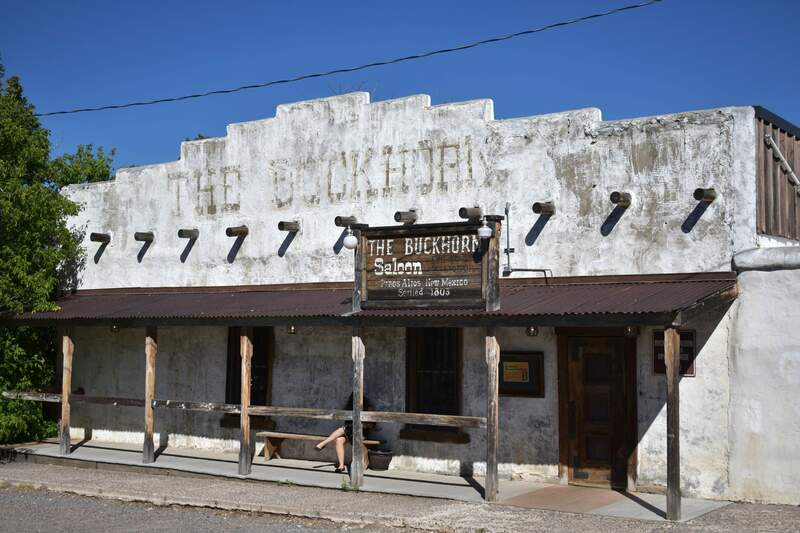 We had heard about the Buckhorn Saloon, built in the 1860s, but we wondered whether we were in the right place. No people, no cars in a dusty parking lot. A weather-beaten adobe front, the painted name barely visible. Was this a ghost-town movie set? But inside – aha! The Buckhorn Saloon in Pinos Altos, N.M., built in the 1860s, features an ornate back bar and welcoming leather-topped bar stools. It was 4 p.m. on a Monday, which explained the empty parking lot. We sat at the bar, the better to talk to Decanditis and watch as our food was prepared in the kitchen. Michael raved about his 16-ounce New York strip, perfectly medium rare and smothered in Hatch green chile sauce – the green chiles grown in the nearby Hatch Valley are a state treasure. I settled on a Buckhorn burger. By the time we left at 6, the parking lot and the dining room were getting crowded. For our anniversary the next night, we chose farm-to-table Revel. The daily special of grass-fed meat from nearby Gila River Ranch was braised goat shoulder – lightly charred, amazingly tender, with roasted carrots, yogurt, figs and lemon preserves – all for $21. Those green chiles made another appearance in butter that came with our cornbread. And still more green chiles! After dinner, we walked down Bullard to the Little Toad Creek Brewery, lured by the promise of Diablo Verde: green chile-infused vodka. Predictably, that vodka comes with a bite. We also tried the Little Toad Creek straight whiskey, which we thought needed more aging, as it was raw and sharp. We had hoped to end our anniversary stargazing at the 3.5-acre Cosmic Campground, the first place in the northern hemisphere designated a Dark Sky Sanctuary. But it was 70 miles away, and we had no camping gear. Instead, we found our own semi-dark skies at the lodge, where we used phone apps to identify Jupiter, Saturn – and finally Venus – high among the constellations. Where to stayBear Mountain Lodge60 Bear Mountain Ranch Rd. Bed-and-breakfast lodging in 1928 Pueblo-style inn. Located 15 minutes outside of town, it is surrounded by hiking trails, labyrinths and lots of art, inside and out. Some rooms are pet-friendly. Rooms from $160. Built in 1938 as a luxury inn but shuttered for 25 years, the Murray was recently renovated with attention to its art deco roots and reopened in 2012. Continental breakfast included. Rooms from $84. An 1882 building just down the street from the Murray, the Palace was restored in Victorian style in 1990. A large painting of Jane Russell as she appeared in “The Outlaw” dominates the lobby, along with photos of historic Silver City. Continental breakfast included. Rooms from $58. Where to eatThe Buckhorn Saloon & Opera House32 Main St., Pinos Altos, N.M. Built in 1865, it boasts a century-old potbelly stove, a carved wooden bar and paintings that suggest its history as a one-time brothel. Green chiles served every which way - in stew or as a sauce on burgers and steaks. Entrees start at $19. Made-from-scratch, locally sourced food that’s creative, adventurous and yummy. Vegetarian and vegan offerings available. Entrees start at $18. Diane’s Restaurant & Parlor510 N. Bullard St.
A local favorite, Diane’s offers a varied and interesting beer list with local drafts. Menu items include Italian and Thai offerings. Lunch and dinner, plus a weekend brunch (try the Hatch Benedict, with a dose of Hatch green chiles for $12). Entrees start at $16. What to doGila Cliff Dwellings National Monument26 Jim Bradford Trail, Mimbres, N.M.
Drive 45 miles north of Silver City along the Trail of the Mountain Spirits (Highway 15) to see this mysterious and elaborate complex of rooms built into high cliff faces more than 700 years ago by the nomadic Mogollon people. Open daily, 9 a.m. to 5 p.m. Admission $10; free with senior lifetime pass, military pass or other federally issued passes. Syzygy Tile106 N. Bullard St.
Named for a celestial phenomenon, Syzygy creates colorful and unique handmade tiles and mosaics. Free tours of the factory. Mon.-Fri., 8 a.m. to 5 p.m.
Look for the large red dot with “ART” in white letters, and stroll more than 20 colorful galleries that line the town’s business district. The association’s annual Red Dot Art Festival (Oct. 7-15) features tours of galleries, plus music, food and a fashion show. Every spring, the association sponsors a studio tour where visitors can meet local artists. Learn about Geronimo, the Apache chief born near the Gila River, and outlaw Billy the Kid, who grew up in Silver City as Henry McCarty. Artifacts from the town’s mining history, a collection of prehistoric Mimbres pottery, plus more than 20,000 photos documenting the history of Silver City. Open Tues.-Fri., 9 a.m.-4:30 p.m. Sat. and Sun. 10 a.m.-4 p.m. Suggested donation $5. Western New Mexico University Museum1000 West College Ave. The university museum already housed the largest permanent display of historic Mimbres pottery in the world when in 2012 it received a gift of the distinctive black-and-white pottery excavated from a site in the Mimbres Valley. Visitors can’t see the collection until July 2019, as the museum is undergoing a $3.2 million renovation. Gila National Forest includes the nation’s first wilderness area, established in 1924. Its 3.3 million acres offer backpacking, kayaking on the Gila River, mountain biking, horseback riding and natural hot springs. Hikers can connect to the Continental Divide National Scenic Trail. Forest is open to the public all year except in extreme conditions. Office open Mon.-Fri., 8 a.m.-4:30 p.m. No fees for hiking and camping; other activities may require permits.